My favorite sitcom of all time is Hogan’s Heroes, a silly comedic series of ever-more-unlikely scenarios about the efforts behind-enemy-lines of a group of POWs in German Stalag 13 during WWII. 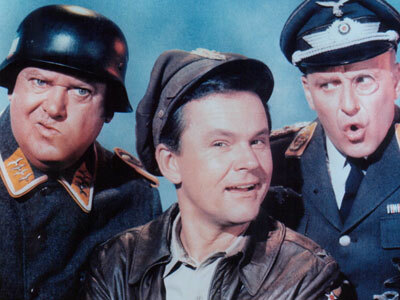 The show starred Bob Crane as the ranking POW, Col Robert Hogan, and Werner Klemperer and John Banner as the inept Stalag Commandant (Col Wilhelm Klink) and Sergeant of the Guard (Sgt Hans Schultz). Col Hogan would receive regular communiqué from “London” (a vague allied higher headquarters) about crucial enemy goings-on near their place of incarceration. Then the intrepid Col Hogan and his troop of bumbling, half-witted, clichéd characters would sneak out of the camp, complete the mission and sneak back in with no one the wiser. There were a couple of funny close-call episodes where German “High Command” noted the radius of destruction with Stalag 13 as the epicenter – these episodes generally devolve into a frantic attempt to save their own mission by delivering the incompetent dupe Col Klink from the threats of the High Command to send him to “the Russian front” – a move which would likely bring a new and more capable Stalag Commandant. I’ve always loved Hogan’s Heroes and believe that the better episodes are, for the most part, the sillier episodes. But I don’t think that the show appeals to me because of its completely unrealistic nature, or even the quick, over-used one-liners which pop up (“I know nothink!” – Sgt Hans Schultz). What kept me watching re-runs on TV and eventually buying the whole series on DVD was that it completely makes light of something which is so … well … un-make-light-able. War is a horrible thing. All of war’s products – destruction, death, chaos, loss, hatred, etc. – are horrible. But I think that there is something kind of refreshing about man’s ability to be surrounded by the death and destruction we bring upon ourselves and still lighten the mood with a little jocularity; to maybe see and appreciate the glimmer of the divine amongst the soot of the human. And that is from where I truly believe this ability comes. The small link that we have to the divine, the minutest flicker of something which transcends our mire … it must come from something which is not human within us. I believe wholeheartedly that our corrupt humanness – that part of us which does not do what we want, and instead does what we hate (see Rom 7) – is the source of all of the strife and anguish we meet in life (this is what separates us Christians so completely from the humanists). In the meantime the little bits of goodness, the light amongst the darkness, the refreshing water of love in a parched land of selfishness is a result of the little bit of Himself that the creator God placed in us from the beginning. It really does allow us to see the humor in something humorless and make light of the heavy morass that plagues us because of our sin … and all because that part of us gets a glimpse of the future glory which God has promised. All of this brings me to where our own battle lines are drawn. The battle lines of WWII, of Hogan’s Heroes, were the physical lines running along rivers, ridges, space between strongholds and the range of bombers, battleships and U-boats, but in life they are spiritual and still no less physical. The Bible makes it abundantly clear that this world is fallen territory, controlled by the enemy. Satan is described as the “prince of this world” by none other than Jesus in His discourse at the Last Supper (Jn 14). To deny that this world is fallen and broken and sinful and ‘enemy territory’ is akin to denying that walking into the molten rock of a volcano will do your body harm. And yet many people – Christians among them – will deny just that; whether due to a mistaken belief about the spiritual realities present around them or whether due to a spiritual hubris that believes in a supernatural human control over the entropy present on a global scale. We are unequivocally “behind enemy lines!” Not in a Gene Hackman/Owen Wilson type of way, or even in a “Great Escape” kind of way. But in a weird flip on reality, the least realistic example from Hollywood is the one most spiritually accurate: we are behind enemy lines in a Hogan’s Heroes type of way. Think about Jesus’ dialogue about the relationship between His followers and the world in John 15:18-25. Jesus said, “If the world hates you, keep in mind that it hated Me first. If you belonged to the world, it would love you as its own. As it is, you do not belong to the world, but I have chosen you out of the world. That is why the world hates you” (Jn 15:18f, NIV). We’re still IN this world, but we are not OF this world (a statement which may have lost its power through all of the repetition and cool NOTW bumper stickers). Like Hogan’s crew IN enemy-held territory, but not OF the enemy and, like Hogan’s Heroes, we’re active participants rather than passive prisoners. Now consider our mission. We were told by Christ – in His last instructions, before His ascension no less – to “Go and make disciples of all nations, baptizing them in the name of the Father and of the Son and of the Holy Spirit, and teaching them to obey everything I have commanded you. And surely I am with you always, to the very end of the age” (Matt 28:18-20, NIV). THAT statement reveals our mission instructions from “London” (if you will), and they couldn’t be any more other-worldly. Let’s parse up the statement a little bit in order to see this more clearly. 1) Acknowledging that it exists – something much more important than we think. It has become too easy to pretend that sin is in the eye of the beholder or justified by the end product, and it has become too easy to wink at spiritual ignorance or to hamstring the truth of God by trying to bend it to fit with other philosophies. 2) Acknowledging that we are all sinners – something which is denied by humanists. The idea that man, and the world which surrounds him, can be perfected by moving through evolutionary stages denies our actual spiritual state of need. 3) Acknowledging that Jesus is the One to follow – something which is necessary to “make disciples” (followers). 4) Acknowledging that we must “go” – it requires something of us. We cannot sit idly on the sidelines. We must engage the enemy on the frontlines, behind the frontlines, or even “underground” … and win souls from him. 1) Renewing them – baptism is not simply a dunk in the water, it is a thorough spiritual cleansing through contact with Christ’s blood and the mirroring of Christ’s death, burial and resurrection. 2) God’s person – baptizing in the name of God brings a disciple/warrior into contact once again with his maker, baptizing in the name of the Son brings a disciple/warrior into contact with the One who saved him, and baptizing in the name of the Holy Spirit brings a disciple/warrior into contact with the One who guides him. THAT is a thorough change of life! 1) Continually bolstering the faith of the warrior beside us. Exhorting them through psalms, hymns and spiritual songs (Eph 5), prayer (Jas 5), and teaching (Acts 5). 2) Reiterating the words of the Commander. “Talk about [the words of God] when you sit at home and when you walk along the road, when you lie down and when you get up” (Deut 6:7, NIV). And surely I am with you always, even to the end of the age … Jesus may have ascended into heaven, but the Holy Spirit is here. Furthermore, the ‘end of the age’ will be the end of this war, when Christ will return in the same way He left: triumphant over death and victorious over Satan. One more analogy from Hogan’s Heroes before this post is finished: I mentioned the bumbling, half-witted, clichéd characters with whom Hogan worked and I honestly feel a strong sense of commonality with them. They included a competent, but sometimes under-utilized, radio operator; a cockney Brit who specialized in sleight of hand, chain-smoking, vocal impersonations and womanizing; a shrimp-sized Frenchman who exploited his impressive cooking skills to distract the rotund Sgt Schultz, but who was lacking an imposing physique; and a simple American farm boy who had a knack for explosives … a knack that sometimes still resulted in unexpected and ill-timed explosions. Each one of these characters brought some skill and vigor to the table but were also hopelessly stupid and clumsy at times. They enabled the missions in some episodes and in others were the biggest impediment to success. Confession time: I can honestly say that I’ve been a hindrance to God’s mission more than an instrument for His success behind enemy lines. I grasp that I’m a deeply flawed person and realize that my meager talents are still rough and unrefined spiritually. But the confession ends there because I know that God – my Commander – is not leaving me in that stupid, bumbling, clumsy, awkward, inept, lethargic, selfish state. He’s refining me and He’s utilizing me beyond my capabilities or even my awareness. The one thing I know that I am doing right is that I recognize that the war is all around me and that I’m surrounded by a thousand enemies each day. I see that He has given me a mission to complete in order to restrain the enemy’s plans. And even though I stumble, vacillate and complain, God is still fighting through me. Now it’s your turn … if you want to be useful to God, if you want to be a special ops soldier behind enemy lines, if you want to “fight the good fight of the faith” (1 Tim 6:12), then first acknowledge that the war is raging, second acknowledge that you are behind enemy lines, third acknowledge that your Commander has given you a mission to complete, fourth acknowledge that you are unable to do it on your own and in your present state and fifth give yourself and your abilities over to God for utilization in the war. The mission won’t be easy (He never said it would be), you’ll fall, fail and get hurt, but it WILL be worthwhile. And it will be a glorious victory when the age comes to an end and the Son of God returns with the force of lightning, heralded by shouts of thunder.